Caption slip reads: "Photographer: Snow. Date 1957-07-19. Reporter: Clausen. Assignment: orthopaedic hospital. Dr. William Craig inspects Denice Mailhot, 20 months. She has displaced left hip and is in position with leg rotated out so that the bone will fit into hip socket. 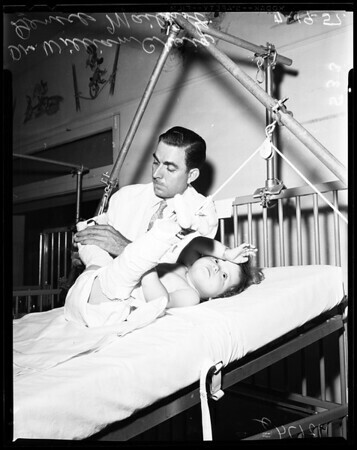 The defect is hereditary generally, as born out by the fact that Denice's mother was treated as a child at Orthopaedic Hospital for the Same condition. The mother has both hips displaced, however."